As many Americans settled down to prepare for the presidential debate Wednesday night, I was at a private dinner in New York City with William Dudley, president and CEO of the Federal Reserve Bank of New York and arguably the second most powerful central banker in the world after Janet Yellen. The atmosphere was relaxed, and Dudley was generous with his time in discussing Fed monetary policy with me and our fellow dinner companions. Of course, he was circumspect and made it clear (as he always does) that his views were personal and not the “official” views of the Federal Reserve System. Despite the disclaimer, there was no doubt in anyone’s mind that we were getting a privileged view inside the mind of one of the key monetary policymakers on the planet. The most important view Dudley expressed was his belief that the Fed will raise interest rates “before the end of the year.” There are only two Fed FOMC meetings between now and the end of the year: Nov. 2 and Dec. 14. No one expects any policy decision on Nov. 2, since it’s just six days before the U.S. presidential election. The Fed may or may not be political, but they are definitely not stupid. The Fed does not want to be blamed by either side for the outcome of the presidential election, so they will take a pass. That leaves December, and the Fed will definitely raise rates then, as I advised readers weeks ago and as Dudley confirmed last night. Once the rate hike discussion was out of the way, the dinner conversation turned to two other equally important topics. I reminded Dudley that after the last rate hike (Dec. 16, 2015, the famous “liftoff”), the stock market fell over 11% in the following eight weeks. That would equate to a 2,000-point drop in the Dow Jones industrial average from today’s level. I asked if the Fed was mindful of that history and if the Fed considered it important to put a floor under the stock market. 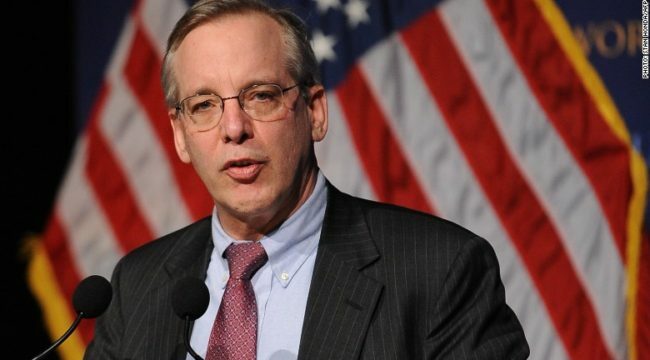 Dudley disagreed with the implication and said that he saw the early 2016 stock market drop as “unconnected” to the December 2015 rate hike. My view is the opposite. The early January 2016 stock collapse was directly related to the Fed’s December 2015 rate hike and the devaluation of the Chinese yuan caused by that hike. Dudley then suggested that the Fed is not worried at all about any damage that might be done to stock markets from the next rate hike. Dudley said it is “not our job” to put a floor under stock prices. Taken together, these remarks told me that the status of the stock market is not an impediment to a December rate hike by the Fed, and that the Fed is unprepared for the market damage that will arise when it does hike rates. The last topic of dinner conversation concerned the relationship between Fed rate policy and the markets, particularly when it comes to Fed communications. Dudley defended the Fed’s communications policy against criticism that there were too many Fed voices giving too many speeches. He said that “some Fed voices are more important than others.” That drew laughter around the dinner table because he obviously includes himself among the “important” voices. But on a serious note, it confirmed what I’ve been telling readers for a long time — that the only communications worth listening to come from Yellen, Fischer, Brainard and Dudley. Most other voices can be safely ignored. Dudley expanded his views on the communications policy by saying that far from confusing markets, the Fed is giving markets a chance to “think along with the Fed” when it comes to financial conditions, economic data and future policy. That’s a pleasant perspective, but in reality, the Fed and markets are not moving down a path together. They are going around in a feedback loop of offsetting initiatives and reaction functions that leave markets fatigued and confused — and leave the Fed impotent to achieve its goals. The Fed is on track to raise rates in December in the face of weak growth data. The Fed seems unaware or unconcerned about the potential impact of a rate hike on asset valuations and investor portfolios. Finally, the Fed seems to believe that the markets understand what the Fed is doing, when in fact markets believe the Fed barely understands what it is doing. The result is confusion rather than concert. The systemic dangers are clear. The world is moving toward a sovereign debt crisis because of too much debt and not enough growth. Declining productivity is the last nail in the coffin in terms of countries’ ability to deal with the debt. Inflation would help diminish the real value of the debt, but central banks have proved impotent at generating inflation. Now central banks face the prospect of recession and more deflation without any real policy options to fight it. This raises the prospect of a new liquidity crisis and financial panic worse than 2008. Persistent low rates have not caused inflation, but they have caused asset bubbles, which threaten to pop and unleash a financial panic on their own — independent of tight financial conditions. When this new panic hits (either from a liquidity shortage or bursting asset bubbles), investors will have no confidence in the ability of central banks to limit the panic. Unlike 1998 and 2008, the next panic will be unstoppable without extreme measures — including IMF money printing, lock-downs of banks and money market funds, and possible martial law in response to money riots. Bottom line: The Fed will raise rates in December. That will be bad news for the economy and for stocks. The Fed does not see the market carnage coming. With this as prelude, investors should hang onto short positions, build cash positions, reduce long equity bets and be prepared for continued strength in the dollar, at least through the end of the year. You should have some gold, land, and other hard assets to weather this storm. But, even with those hard assets, there’s still room for a diversified portfolio. You should never go “all in” on any one asset class including gold, which is why I recommend putting only 10% of your investable assets in gold. Beyond that, a recession and stock market sell-off in early 2017 could cause the Fed to reverse course and either cut rates or use QE next year, which would be bullish for gold.